Westhill men’s shed has disappeared from the Scottish Men’s Shed map of sheds. We can assure you we are still here! Westhill shed is a lively place with a lot always going on. 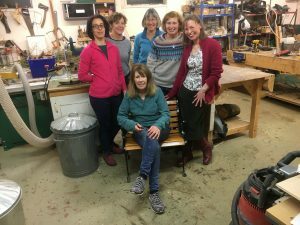 The shed has a well equipped wood and metal working workshop where you can do the things you would in your own shed but with company. Not only someone to chat to but to get ideas from or pass on some of your own knowledge. 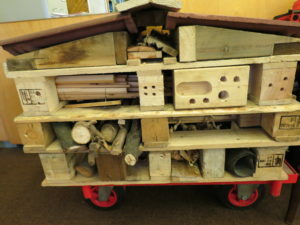 You can bring your own projects to work on, or help the shed with ours. You don’t have to use the workshop, some guys use the coffee table to set the world to rights, others build models, use the computers and 3D printer or play bridge. It is completely free to join and to attend. We keep ourselves afloat by integrating with the community, doing projects as requested by the residents, schools, other charities and others. We also take in unwanted tools to refurbish and lawn mowers, strimmers etc. These are sold to the community at knockdown prices and through all of that we keep the lights on. Everyone is welcome, wherever you live if you can travel to the Shed you can use it. Just drop in anytime we are open and someone will show you around. Opening times Monday 10-4, Wednesday 3-8 Friday 10-4. See the Where? page for location and further contact details. Latest News is at the bottom of this page. See the gallery page for other projects. Always a busy place but equally time for a cuppa and a chat. Shed projects always have a garden bench or two under way with special requests being woven in. The variety of things we are asked to make constantly surprises us. 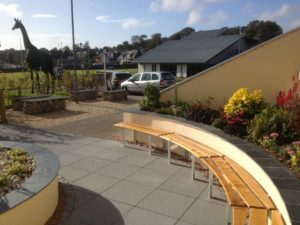 The curved bench at the Children’s hospital is our pride and joy, we have made stage sets for the Academy, mud kitchens, planters, beasty mansions and eco- greenhouses for primary schools. The mainstay is refurbishing tools that have been donated as well as mowers and strimmers etc. 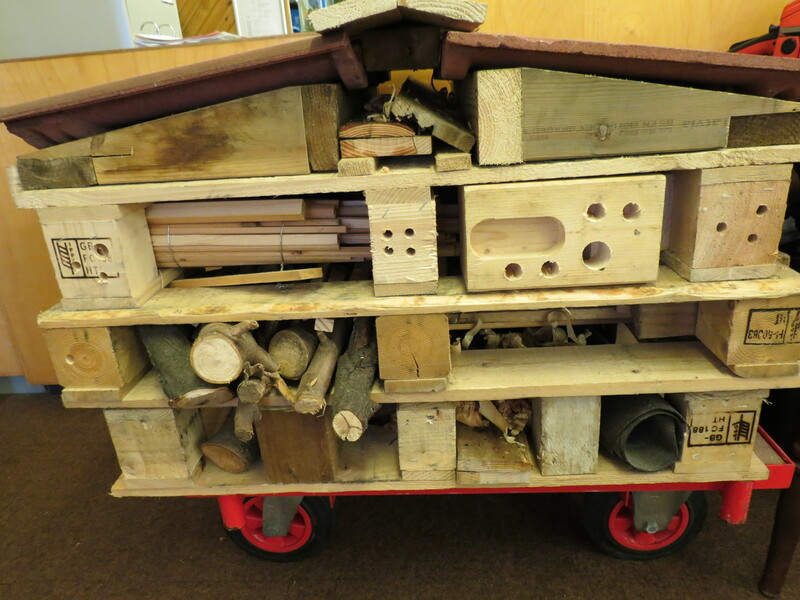 saved from landfill through a brilliant agreement with Aberdeenshire Council and the recycling centre. 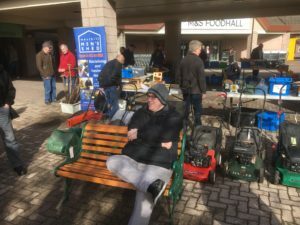 These are sold to the community at knockdown prices and we get a lot of satisfaction from reducing the carbon footprint and finding a good home for some excellent garden and engineering tools. Join our modelling group who are making a model for Peterhead old prison of their quarry and railway. The prison made Peterhead harbour! Learn to make 3D models play bridge or guitar. We have a stock of refurbished tools that have been donated to us as well as wood, screws, nuts and bolts. Funds are raised from local initiatives such as the raffle, social evenings, draws. Currently an extension to the workshop is being built as we are getting crowded. We have talks, usually on Wednesday evenings during the dark nights. Most are health related; we have had talks on prostate cancer, Alzheimer’s, Heart disease and many others given by experts in each field. Local history talks are also given by an expert. These are announced through our mailing list or a poster at the shed. 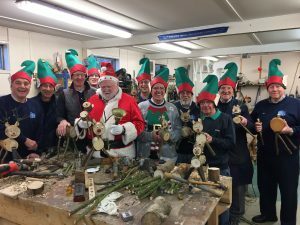 Social events are held at the shed when family and friends are invited for a burns supper, pizza night, BBQ, Xmas lunch etc. If you join the shed we will include you in our mailing list to keep you up to date. Workshop Extension Still getting quotes. We are funding as much as we can ourselves but getting grants to be able to complete it. The Gordon and Ena Baxter foundation are contributing by paying for the inside finishes. The Gordon and Edna Baxter Foundation is a legacy project of the late Gordon Baxter and his wife Ena. The organisation supports charities and worthy community causes throughout the North East of Scotland and the Highlands and Islands. The foundation is chaired by Gordon and Ena’s grandson, James Baxter.